We are currently camped with six other truck camper rigs. 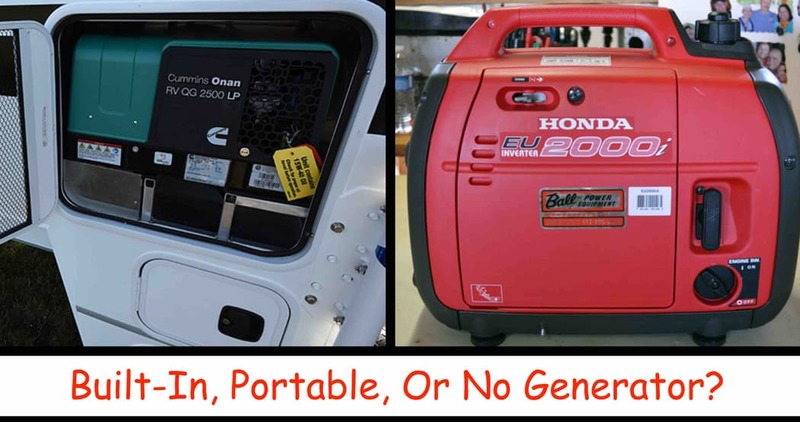 Two have built-in generators, two have portable Honda EU2000i generators, and one has both a built-in and a Honda EU2000i generator. Evidently some guys can’t have enough power options. Talking with the fellas, there are some very strong opinions about the need for a generator, and which type of generator is best; built-in versus portable. The built-in generator guys love their push-button, all-weather convenience. The portable generator guys love their versatility and efficiency. We just shrug after going three years without a generator; built-in or otherwise. We have long thought about adding a Honda EU2000i, but have managed to adapt our power needs around two Group 31 AGMs, one 160-watt solar panel, and a growing list of 12-volt and battery powered items. Of course there was that one time in the Florida Everglades when we had to plug into Mike Tassinari’s built-in generator to charge our batteries, but nobody is ever going to know about that, right? That’s what happens when you try to dry camp in the shade for a week and charge two power thirsty MacBook Pros. Lesson learned. Home » Truck Camper Magazine Blog » Built-In Generator, Portable Generator, or No Generator?